Drugs and medicines are available in different forms. Some of these are tablets, liquid form, suspensions, and syrups, just to name a few. The different forms enable drug administration to people of different ages, people with certain health conditions, and are also made to suit a person’s preference. This is a drug pharmaceutical solution that completely dissolves into its solvent, with the distribution of drugs within the solution being even. Most of them are dissolved into a sugar solution as it improves medicine palatability. The sugar also helps reduce the growth of microorganisms within the syrup. Syrups are ideal for younger children as the high sugar concentration beats any bitter taste. Caution should, however, be taken when administering syrups with a high sugar concentration to diabetic patients. Other drug alternatives with a lower sugar index should be used. This is a drug mixture whereby the drug particles do not fully dissolve into the solvent. They are instead suspended in the medium of the liquid, making it difficult for the drug particles to fully dissolve. Because these two do not mix, the solution is likely to form two layers, with the top being less concentrated than the bottom one. 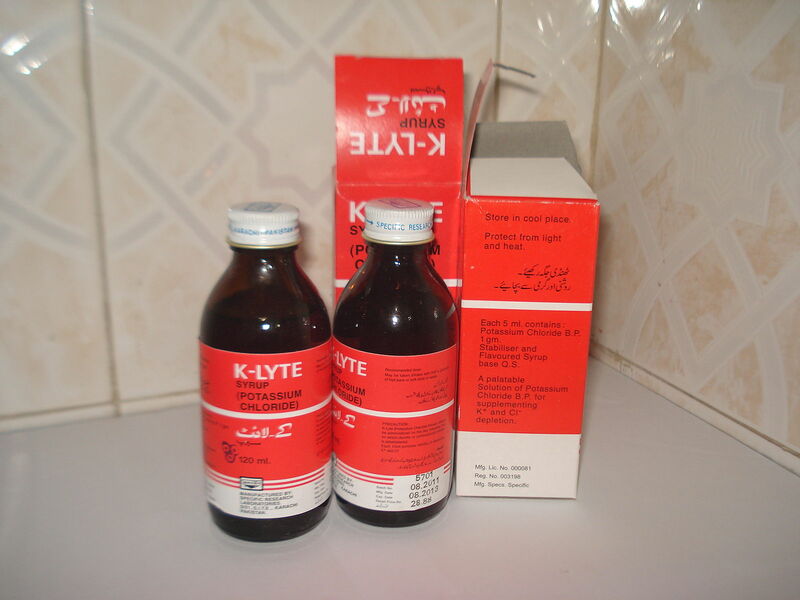 In most cases, the solvent used is water, which is not palatable with many drugs. A suspension is however ideal for diabetic patients as it is not suspended in a sugar solution. While syrup is a pharmaceutical solution that completely dissolves into its solvent, with the distribution of drugs within the solution being even, a suspension is drug mixture whereby the drug particles do not fully dissolve into the solvent. While syrups are dissolved in different types of solvents such as sugar or alcohol, suspensions are dissolved in water. Because they are dissolved in sugar, syrups are ideal for younger children because the sugar wards off the bitter taste. On the other hand, suspensions may not be ideal for children because of an undesirable taste. Due to the high sugar content, syrups may not be ideal for diabetic patients. 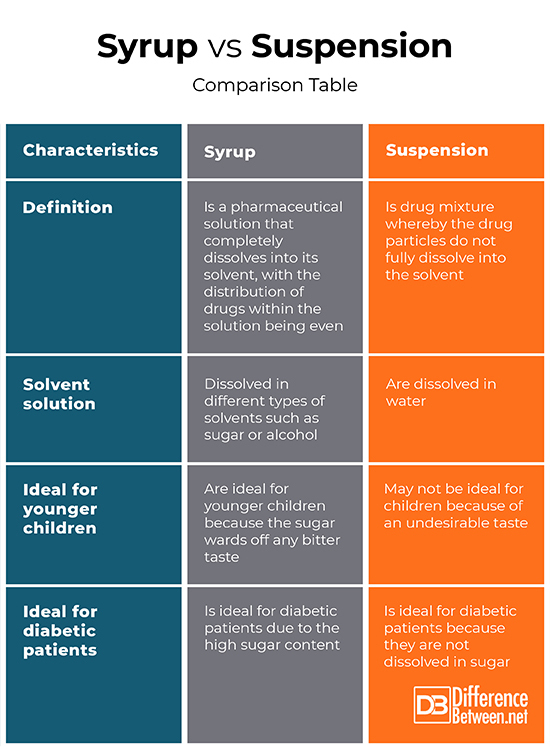 Suspensions, on the other hand, may be ideal for diabetic patients because they are not dissolved in sugar. Both syrups and suspensions ease drug administration. Caution should, however, be taken on any allergies and any conditions that a patient may be suffering from before administering the drugs. Medics should hence educate and make aware to the patients about the different compositions before administering medicines. Tabitha Njogu. "Difference Between Syrup and Suspension." DifferenceBetween.net. January 17, 2019 < http://www.differencebetween.net/science/health/drugs-health/difference-between-syrup-and-suspension/ >.